Florida-based consulting firm CCG was in the midst of building a POC environment for a public school system. Unfortunately, migrations between Azure subscriptions get complex and take up valuable resources, as occurred in this scenario. The VM used managed disks and Microsoft does not currently support moving these types of environments through the Azure Portal or any other tools. However, CCG had already spent a significant amount of time building the environment. 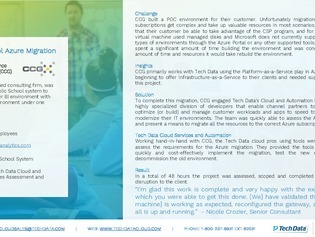 By accessing the following case study, you’ll be privy to a partner that assessed the requirements for the Azure migration and presented a means to migrate all resources to the correct Azure subscription.